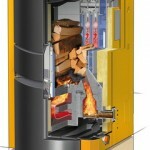 The TDA Thermodual range from SHT is unique in the principle of the combined firing of wood logs and pellets with two combustion chambers, and two sensor systems in one boiler. With the pellet combustion chamber placed directly beneath the log chamber, an exceptionally quick switching between the two is ensured. This minimises emissions and maximises the efficiency by switching between fuels quickly. The two sensor systems, lambda probe and flame temperature sensor, enables the boiler to detect and burn each respective fuel. 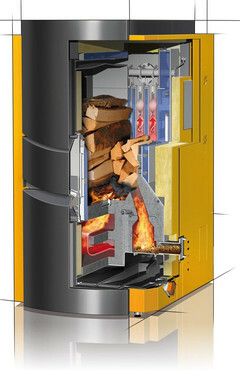 The flame sensor recognises, through variations in combustion temperatures whether there are logs in the fuel chamber, or whether to run on pellets and start the pellet insertion auger. The lambda probe continuously monitors the combustion gases to alter the amount and direction of the combustion air so that each fuel is burnt in the most efficient way possible. The high grade refractory combustion chamber enables effective residual heat to remain for many hours, reducing the need for the electrical ignition and speeding up the start up phase. 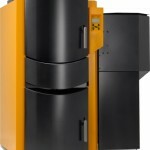 These boilers are now DEFRA exempt. Contact us for more information, or fill in our quotation form.